Alxasaurus (/ˌɑːlʃəˈsɔːrəs/; "Alxa Desert lizard") is a genus of therizinosauroid alxasaurid theropod dinosaur from the Early Cretaceous (Albian) Bayin-Gobi Formation in Inner Mongolia. It is one of the earliest known members of the superfamily Therizinosauroidea, but it already possessed the body shape - including the long neck, short tail, and long hand claws - of later therizinosauroids. Like other members of this group, it was a bipedal herbivore with a large gut to process plant material. Several specimens are known and the largest was a little over 3.8 metres (12 feet) long. According to Gregory S. Paul, it was 4 metres (13 feet) long and its weight was about 400 kilograms (880 pounds). This dinosaur was first described and named by Canadian paleontologist Dale Russell and his Chinese colleague, Dong Zhiming, in a paper published in 1993. However, although the paper is technically included in the last issue of the 1993 volume of the Canadian Journal of Earth Sciences, this issue was actually released in the early weeks of 1994. Alxasaurus is named after the Alxa Desert of Inner Mongolia, also known as the "Alashan" desert, and the name also includes the Greek word sauros ("lizard"). Alxa (or Alashan) is also the name of the league, or administrative division, of the Inner Mongolia (Nei Mongol Zizhiqu) region of the People's Republic of China. The single known species (A. elesitaiensis) is named after Elesitai, a village found in this region, near which the fossil remains of Alxasaurus were located. 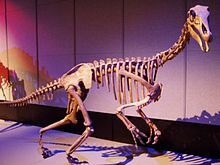 Five Alxasaurus skeletons were recovered from the Bayin-Gobi Formation of Inner Mongolia, which dates to the Albian stage of the Early Cretaceous Period, or about 112 to 100 million years ago. The holotype, specimen IVPP 88402a, which is considered to exemplify the genus and species, is the largest and most complete of the five, consisting of the mandible (lower jaw) and some teeth, as well as many limb bones, ribs, and vertebrae, including all five sacral (hip) vertebrae and the first nineteen tail vertebrae. The other four specimens are the paratypes: IVPP 88301, IVPP 88402b, IVPP 88501 and IVPP 88510. Together the skeletons represent most of the bones in the body aside from the skull. While exhibiting many typical therizinosaur features in overall body shape and in the teeth, the skeleton of Alxasaurus also shows several features present in more typical theropods, and the discovery of this animal provided significant evidence that therizinosaurs were aberrant theropods. Specifically, the semilunate carpal bone of the wrist is found only in maniraptoran theropods, which also include oviraptorosaurs, dromaeosaurs, troodontids, and birds. Even more basal therizinosaurs such as Falcarius and the feathered Beipiaosaurus have since been discovered with more theropod features and have helped to solidify this arrangement. Alxasaurus is now thought to occupy a position between the early Beipiaosaurus and later therizinosaurs such as Erlikosaurus, Segnosaurus, and Therizinosaurus itself. ^ a b Benton, Michael J. (2012). Prehistoric Life. Edinburgh, Scotland: Dorling Kindersley. p. 326. ISBN 978-0-7566-9910-9. ^ Russell, D.A. & Dong Z. (1993). "The affinities of a new theropod from the Alxa Desert, Inner Mongolia, People's Republic of China". Canadian Journal of Earth Sciences. 30 (10): 2107–2127. doi:10.1139/e93-183. Retrieved 2012-10-17. ^ Clark, James M.; Maryańska, Teresa; Barsbold, Rinchen (2004). "7: Therizinosauroidea". In David B. Weishampel; Peter Dodson; Halszka Osmólska (eds.). The Dinosauria (2nd ed.). Berkeley: University of California Press. pp. 151–164. ^ Pu, H.; Kobayashi, Y.; Lü, J.; Xu, L.; Wu, Y.; Chang, H.; Zhang, J.; Jia, S. (2013). Claessens, Leon (ed.). "An Unusual Basal Therizinosaur Dinosaur with an Ornithischian Dental Arrangement from Northeastern China". PLoS ONE. 8 (5): e63423. doi:10.1371/journal.pone.0063423. PMC 3667168. PMID 23734177.